Rose Schneider (1895-1976) Mission Valley, San Diego oil on board 20 x 24″ signed lower right. 22k deeply carved frame. A friend brought me an old photograph of this exact scene. These are the outbuildings of the San Diego Mission on Friars Rd. p.o.r. Rose Schneider was born in La Grange, Missouri October 15, 1895 and moved to San Diego with her family in 1898. She studied painting under Maurice Braun and Charles Reiffel and was a member of the San Diego Art Guild. She exhibited throughout the state in the 1930s and 1940s. 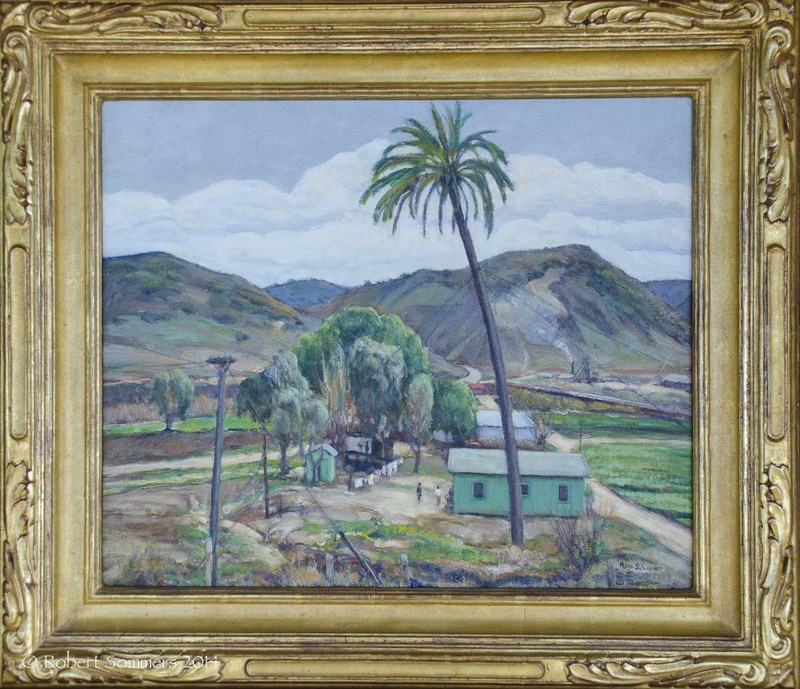 One of her paintings was exhibited at the California Pacific International Exposition in 1935. Her work received an honorable mention at the California State Fair in 1947 and she continued to paint until the late 1950s. Rose Schneider died in San Diego, California February 20, 1976.